This new series of greyscale paintings from 2014–2015 marks an exciting and significant development in Rae’s practice. Each painting’s composition predicates a notional figure, whose existence is simultaneously manifested and denied in a theatre of direct performative mark-making. These are abstract compositions teetering on the edge of figuration, expressively rendered in black, white and tones of grey. Within this rigorous and strategic system of hue reduction and subtle balancing of tonal relationships, Rae has nevertheless created an intensely colourful and dynamic suite of paintings that embody both the tropes of high modernist idealism and the distanced manipulations of a Photoshop-inflected present. Alongside these paintings, a series of small-scale charcoal drawings will be shown – a new expressive medium for the artist – and one upon which her wit and restless invention are brought dramatically to bear. 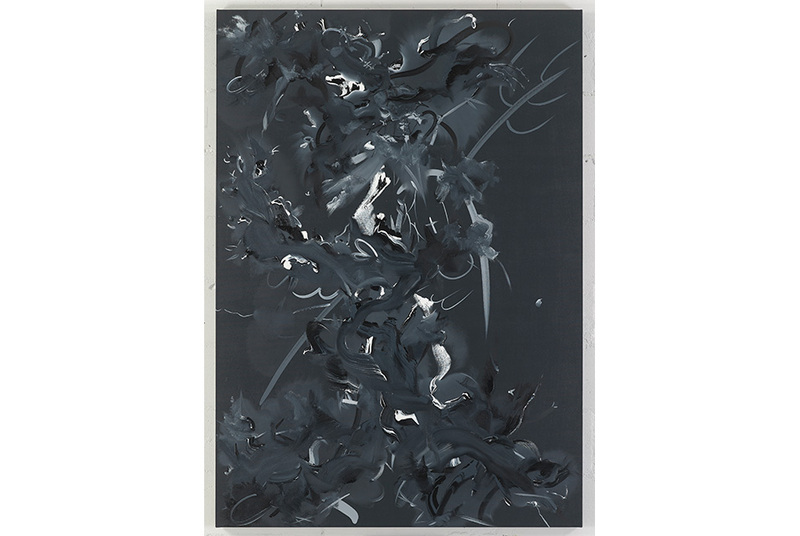 Inspired by a variety of sources from Chen Rong’s thirteenth-century Nine Dragons to Robert Rauschenberg’s Erased de Kooning Drawing (1953), Rae challenged herself to find a way of representing the figure that synthesised its historical traditions with the contemporary existential experience of self: "I wanted to be de Kooning making a Woman drawing or painting, and at the same time I wanted to be Rauschenberg erasing it. That seemed to me to be the perfect answer to the problem of allowing oneself to make a drawing of a figure without disappearing into the past. Doing it and undoing it until some kind of image just about arrives. With the paintings, I had the same notion of erasure, while at the same time both longing to make a figure appear and wishing to remain in the field of abstraction."